Most of us hate overpaying for anything. Yet we do this all the time without realizing how much money we are throwing away. 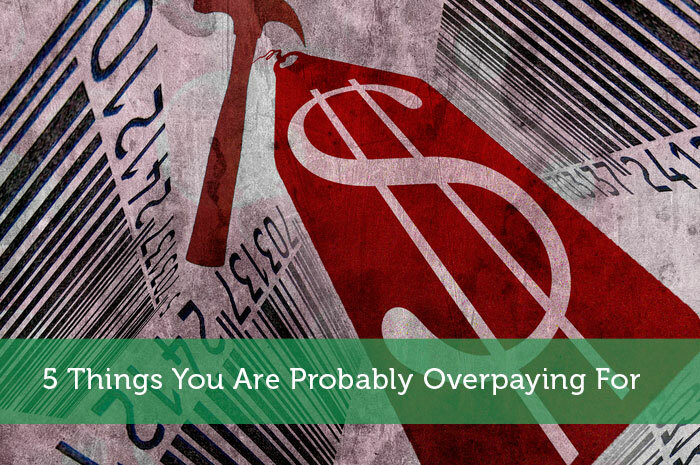 Below is a list of five things that you are probably overpaying for, along with some simple steps to reduce their costs. Have a look at these suggestions and see how much money you can save. If you have pay-TV and/or Internet service through a major carrier like Comcast, Time Warner, or Cox Communications and are not on an introductory or promotional rate plan, there is a good chance you can reduce your rates. Often, these companies will lower your monthly bill if you are willing to haggle with them a bit over the phone. In fact, according to a recent Consumer Reports survey, 43% of consumers who called their pay-TV and/or Internet provider after an introductory or promotional rate ended were able to negotiate a new deal. To help your negotiation go as smoothly as possible, it’s a good idea to research the cost of introductory and promotional offers by competitors in your service area. Chances are you will find at least a few appealing deals that are comparable to your current service plan. When you call your service provider to negotiate cheaper rates, use the best deal you found as leverage. If your service provider responds to your plea by offering you some type of service upgrade such as faster Internet speed or a free premium channel, politely decline their offer and let him or her know you are strictly interested in lower rates. This should lead to a deal that reduces your monthly payments significantly. In the event that your requests fall on deaf ears, you can try calling back and threatening to discontinue your service. Generally, this will get your call rerouted to the customer retention division who will be more likely to work with you and offer you deeper discounts. If you still can’t get your rates adjusted, you may want to seriously think about taking the more appealing deal you found. After all, being loyal to a telecom provider that is charging you more for less does not make sense from any angle. Most consumers shop for their clothing at department stores like Macy’s, Sears, and Dillard’s. However, you can often find the same garments sold on their racks for nearly half the cost elsewhere. If there are a few specific brands that you are attached to, consider making an occasional trip to an outlet mall to do your clothing shopping. Chelsea Premium Outlets and Tanger Outlets operate the largest networks of outlet centers, with a combined total of over one hundred locations in the United States. Their shopping centers ae typically found on the outskirts of major cities, and generally they house outlets for a number of the most popular apparel brands in the business. However, I would suggest trying try to avoid visiting these stores on weekends, when they tend to be packed with tourists. If you are not attached to a few particular brands, consider shopping at off-price retailers. Among the many off-price retail chains, Marshalls, T.J. Maxx, Ross, and Burlington Coat Factory consistently receive the best consumer reviews. Like most off-price retailers, all of these chains feature brand-name clothing, accessories, footwear, towels, linens, luggage, and kitchenware for up to a 60% discount. With a little luck, two or three of these chains will have stores in your local area. If you are one of the many consumers who wear eye glasses, you should be able to save quite a bit of money on this expense. There are two good options to accomplish this goal. The first option is buying your glasses from discount eyewear retailers such as Costco, BJ’s Optical, Sam’s Club, and Wal-Mart. Eyewear sold at these stores is 40% cheaper on average compared to more popular optical chains like Lens Crafters, Pearl Vision, and Sunglass Hut. Another option is to get your lenses replaced in one of your existing frames. Should you need a new prescription, you can call the optometrist listed in your area and make an appointment with the least expensive one you can find. If this is not necessary, get in touch with the last optical shop where you bought a pair of glasses and have them fax you a copy of your prescription. By law they are required to pass this information on to you, and generally they will be more than happy to do so. When you buy replacement lenses, don’t make the mistake of going to an optical shop. Several reputable websites will replace eyeglass lenses for a fraction of the cost that retail stores charge. Of these sites, 39DollarGlasses.com is the most widely used. For thirty-nine dollars, this site will replace your old, single-vision lenses with new polycarbonate, high-index lenses. These lenses are thin and lightweight and include 100 percent UVA and UVB protection, along with a scratch-resistant coating. In addition, if you want to add a glare-resistant coating, you can do so for just twenty-five dollars, instead of paying upward of seventy-five dollars at a retail store. If you would like to buy inexpensive backup glasses, you can get an ultra-discounted pair from ZenniOptical.com and EyeBuyDirect.com. Both sites have numerous options starting at seven dollars for frames and single-vision lenses. Although I wouldn’t recommend using such glasses for your primary eyewear, they tend to work just fine as backups. The only major drawback to buying glasses online is the inconvenience of having to have them adjusted after they arrive in the mail. However, most optical shops will not charge you anything for this service if you look around the store for a minute or two. Out of warranty car repairs tends to be one of the biggest, unexpected expenses that we all encounter at one time or another. The easiest way to minimize this financial burden is to buy needed auto parts yourself. Although doing this will void the service warranty, this is a small risk to take for tremendous savings. Most dealerships and chains will not allow you to buy your own auto parts, but independently owned auto shops will rarely object to this request. You should be able to find any auto part you need in local auto parts stores or on e-commerce sites, such as Motors.eBay.com, JCWhitney.com, or AutoPartsWarehouse.com. If the parts you require are very expensive, you may want to consider buying them secondhand, especially if they are non-mechanical. Although buying secondhand parts has obvious drawbacks, the savings often outweigh the disadvantages. Typically, used auto parts cost about 70 percent less than new components, providing a unique opportunity to save money. Finding specialty parts such as car wraps, protectors and wheel covers can offer money savings as well if you find the right shop. Car-Part.com is a great website for tracking down any secondhand part you desire. Unlike most e-commerce sites, Car-Part.com does not sell parts directly to consumers. Instead, it will provide you with contact information for independent sellers and junk yards in your area that have the parts you require. Next to the contact information for each seller will be a detailed description of the part’s condition and the seller’s asking price. Motors.eBay.com is another good website from which to buy secondhand parts, particularly when lightweight components are needed. Similarly to Car-Part.com, eBay’s inventory should include any automotive part you require. Buying single-use alkaline batteries is an enormous waste of money that can potentially cost you hundreds of dollars over time. As opposed to routinely making this wasteful purchase, invest in a couple of sets of rechargeable batteries. Unlike a few years ago, you can now get nickel metal hydride (NiMH) rechargeable batteries that come pre-charged and maintain 90 percent of their power, even after sitting idle for six months. Like the last generation of rechargeable batteries, they can be reused hundreds of times. The cost for a charger with four AA or AAA NiMH batteries starts at around fifteen dollars. Considering how inexpensive this is, it’s a wonder anyone would repeatedly purchase single-use alkaline batteries over and over again. Author Bio: RICHARD SYROP grew up in a family that viewed saving money as a passion, hobby, and lifestyle. Over the years, he has seen and personally tested just about every saving method imaginable. Dissatisfied with conventional ways to reduce expenditures, Richard developed a unique approach to savings which does not require consumers to give up their favorite products, entertainment or travel. He has presented these saving methods in his new book Effortless Savings: A Step-by-Step Guidebook to Saving Money Without Sacrifice. Richard lives in Seattle, Washington with his wife Urja. We definitely have been paying too much for car repairs, but we’re pretty aware of it! Since I now have two kids I made the switch to rechargeable batteries and it saves me a tonne. Also i wait till the rechargeable batteries go on sale and then I stock up. Another tip to cut down your bills is cut down your banking fee service plans. I changed mine from 17$ which included services I did not need to 4$ a month. Every dollar counts! Clothing has always been my problem. It definitely hurts when I buy a top from Macy’s and see the same one a few weeks later in TJ Maxx. Now I try to just go to the off-price retailers first! Or if I’m lucky… convince myself not to go at all! Good call on the clothes! We try to get as much of our clothing used as possible. New clothes are such a racket when you can get stuff for an absolute fraction of the price at a thrift or consignment store. And, if you can’t find it used, sales are certainly your friend :)! Batteries was an interesting one to be listed! I am a huge fan of rechargeable batteries. On a similar note, I would add diapers! You can buy cloth diapers that you can reuse and save hundreds, if not thousands on diapers. I know it’s kind of a hippie-frugal thing to do, but it’s worth it. You tried something new!! Good for you! I’m always afraid I’ll mess up when I try new stuff. What made you decide to try something new? I’d like to get motivated. Maybe you have some ideas you can share. Good advice. I am actually planning to talk to my internet provider. I hope to get some refund or to lessen my monthly bills. Their services are not good because I have experienced low internet connection for the past few weeks. I am not getting what I paid for. Thus, I deserve some money-back stuff there, you know. Thanks for your article. I agree on the clothes! It’s my weakness so I just avoid going to the mall altogether. We used to call our cable company’s “retention department” when our promotional plan was up to get back on a combo plan…..however they changed their pricing structure to not have any promotional plans. I’m actually relieved that everyone just gets the same price, less hassle when the promotion period ended. My boyfriend kindly took my car to get repaired (with coupon in hand) only to come home with the invoice for more than it should have been! I couldn’t believe it. Instead of going back up there and complaining (because he tried to get it right while he was there), I called corporate customer service; sent a copy of my invoice via email; and was reimbursed $22! It was a huge win for me. It just goes to show that you have to be on your game when it comes to “car repairs” (even if it’s as little as an oil change). At one point or another in my life, I have overpaid for all of these. However, over time, and especially in the last year or two, I’ve been able to cut the fat from them all. The hardest was probably the car repairs, but I know use a local guy that I knew through a friend who does most of my smaller repairs for free and charges very reasonable prices for everything else. Its about finding someone who can trust when it comes to car repairs in my opinion! Nice list. You should add insurance to it. I’ve found that by looking at our insurance once per year we’re usually able to find some savings. Either by switching (we did this once) or more often just by calling and referencing other companies rates. Saving a few bucks a month really adds up fast! When we switched insurance companies we saved +$700 that year! I definitely got my last pair of glasses online at Coastal.com for $30. I was really nervous about it, but they’ve worked out great. You could certainly add insurance to that list. We try to negotiate our insurance at least once per year. There is always a company willing to give you a better rate. Regarding the internet connection, you have a made a good point to negotiate politely with the service providers but it becomes impossible sometimes if there is only one provider in an area. We are forced to take their service according to the service plans they have.